Morgan didn't mean to do anything wrong that day. Actually, she meant to do something right. But her kind act inadvertently played a role in a deadly tragedy. In order to move on, Morgan must learn to forgive-first someone who did something that might be unforgivable, and then, herself. But Morgan can't move on. She can't even move beyond the front door of the apartment she shares with her mother and little brother. Morgan feels like she's underwater, unable to surface. Unable to see her friends. Unable to go to school. When it seems Morgan can't hold her breath any longer, a new boy moves in next door. Evan reminds her of the salty ocean air and the rush she used to get from swimming. He might be just what she needs to help her reconnect with the world outside. 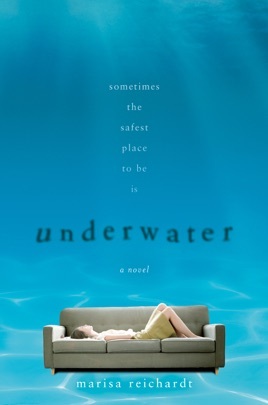 Underwater is a powerful, hopeful debut novel about redemption, recovery, and finding the strength it takes to face your past and move on. Life goes on, even after a tragedy, something 17-year-old Morgan finds difficult to accept. While her friends have returned to school after a shooting that left students and teachers dead, Morgan, once a competitive swimmer and popular straight-A student, won't leave the small apartment she shares with her mother and brother. Morgan's therapist is trying to get her to take baby steps into the outside world, but the big impetus comes when a handsome boy moves in next door. Debut author Reichardt doesn't oversimplify: Morgan isn't saved by love; rather, new neighbor Evan reminds her of life and what it's like to have a friend. His surfer good looks don't hurt, but what really matters is their shared love of the water and his kindness to both Morgan and her younger brother. Morgan's ability to face her past and future ebbs and flows, making her struggles entirely believable. As Evan, who has his own connection to the shooting, tells her, what he likes about Morgan is that she's real, and that's exactly what readers will appreciate about this book. Ages 12 up.